Disclosure: "This post contains test products by Napoleon Grills and affiliate links. All opionions shared are my own." A mouth full of italian that title… So let me take some time to explain what you will be eating tomorrow! I bet you know what pasta is! If you don’t, go educate yourself immediately! But Scampi alla Griglia might need some extra attention for those who don’t speak a word italian. 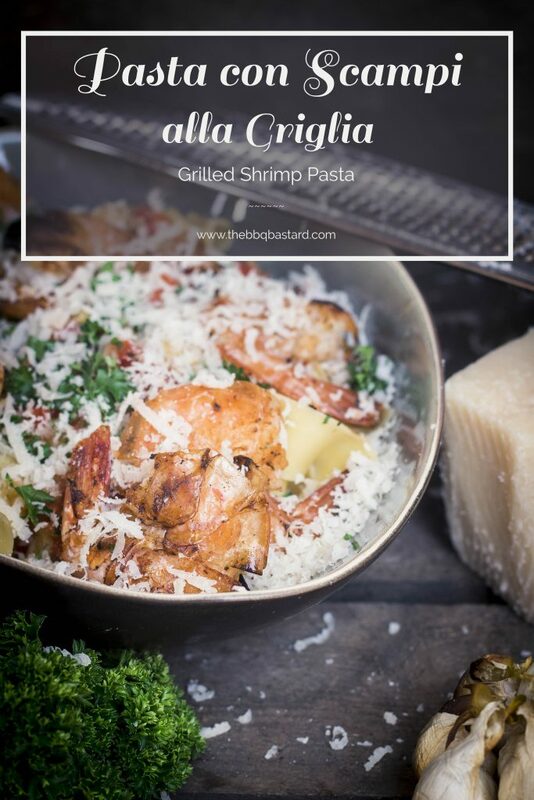 Scampi alla Griglia means grilled shrimps. One of my favorite fruits the sea has to offer! Especially when grilled I believe their taste is nearly unbeatable! Make sure you clean them thouroughly (see instructions below) and leave their shell one! The shell contains a lot of taste that infuses the shrimps when cooking! Outstanding! For Italians their country and flag is their pride! The typical italian food has the colours of the italian flag. I tried to do the same for my Scampi alla Griglia pasta bowl. The scampi are marinated in rapeseed oil spiced with: “oregano, sage and basil” for the green part, “garlic powder and salt” for the white and “chili and smoked paprika powder” for the red. 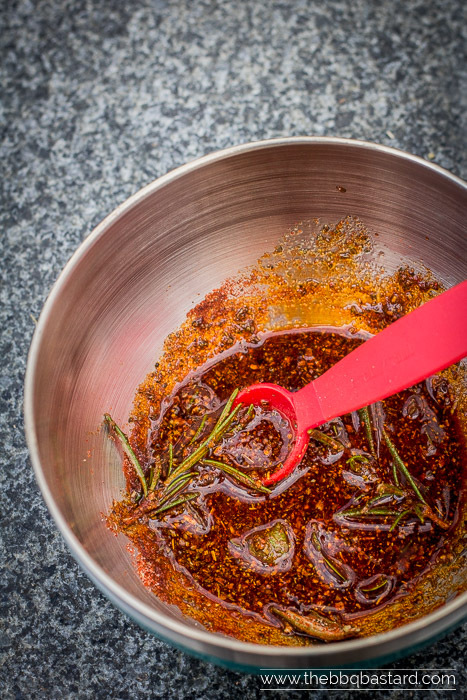 I also added some lemon pepper for a fresh peppery note (learn to make it in this post). 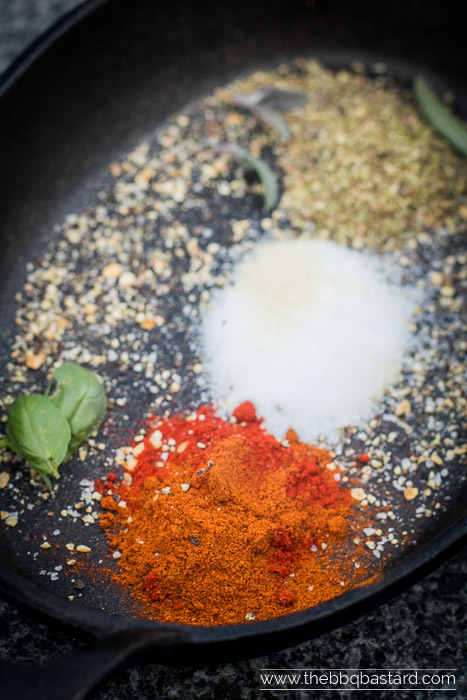 The combination brings a well balanced slightly spicy seasoning that empowers the delicious taste of the Scampi alla Griglia! Unlike the Italian classic “Pasta aglio olio” this recipe contains some more ingredients. The star ingredient is the “aglio affurnicato” or smoked garlic. By slowly roasting the garlic with smokewood the garlic turns dark brown due to the caremelization process. By adding dried vines to the fire in this process the garlic will get a nice smokey nutty taste in the end. Less sharp than fresh garlic and a bit sweeter. You got to try it! It’s truly impressive! Unfortunately I forgot to take pictures of the result since my sister was visiting me. But she’s my witness in case of doubt. Adding BBQ flavor to a gas grill? I used the left burner to get one side of the snake burning. Once the first briquette and the one on top was hot and the vinewood started to smoke I shut the gas down and let the snake do it’s job. This way I could keep the dome temperature around 90-100°C (around 200°F) for the complete four hours. After I’ve smoked the garlic I added some more briquettes and made them all burn for the “Scampi alla Griglia”. A little bit cheating on the “using a gas grill” yet a nice option by Napoleon grills if you want to cook on coals without buying a second BBQ. Thank you for stopping by for this recipe! I hope you leave a message in comments below or through social media sources to share your thoughts and cooking experiences! Being a bit of a thrill seeker I would love to see my posts go viral! But I need your help for this! Click and share to your mates and tell them to spread the word! Or just join us on Facebook for a chat on beer and bbq! 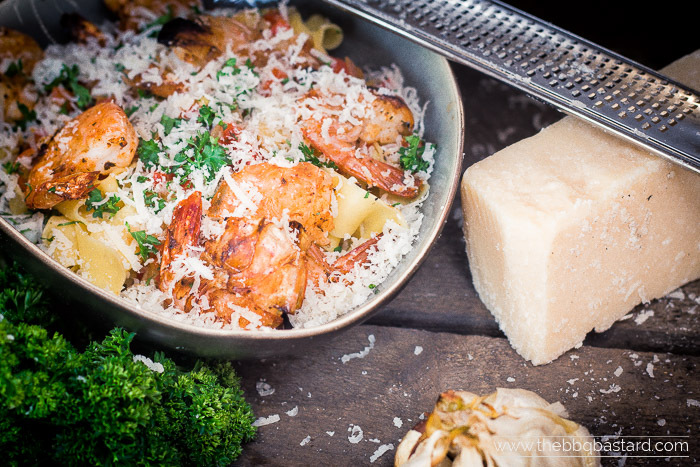 With this recipe I tried to add some natural tastes to the pure italian kitchen! The slow smoked garlic brings some depth without adding a lot of flavorizers. And in my humble opinion a scampi is best when grilled. The combination of these threats in one pasta bowl makes this a perfect meal to celebrate your holidays! Clean the scampi by removing the black vein running on the back of the shrimp. Use a sharp knife to make a cut in the center of the back from the head to the tail end. Put the tip of your knife under the vein and carefully remove it by lifting the tip of your knife. Mix the spices through the rapeseed oil and stir thouroughly. Add the scampi to the spiced oil and rub the scampi thouroughly with the spiced oil. Put the scampi in the fridge for at least 4 hrs. 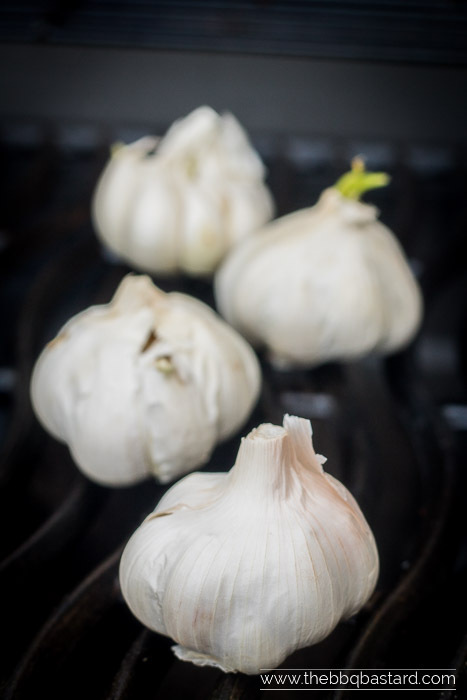 Smoke one bulb of garlic for at least 4 hrs. on an indirect low heat source (about 90°C/200°F). This will make the garlic softer and sweeter in taste and leaves a subtle note of smokey nuts. I used my Napoleon Rogue Gas grill with the cast iron coal tray where I made a snake with coconut briquettes and put some vine wood on top. To light the snake I heated the left briquette and turned of the heat source when hot. Roast the bell pepper on a hot fire source directly above the heat. Roast the bell pepper until the peel is blackened. This way it's easier to remove the peel and you'll get a nice sweet roasted flavor in your bell pepper. Meanwhile put a large cast iron skillet on hot fire source (about 200°C/400°F). Add the rapeseed oil. While the rapeseed oil is heating up chop the onions thinly. Add them to the oil with the smoked garlic and thinly chopped hot peppers. Let simmer for about 5-10 minutes. Add the grilled bell peppers after you've removed the peel. Add pepper and salt at taste. Let cook on a low heat source while you cook the pasta (time depending on the pasta you use) and grill the scampi. 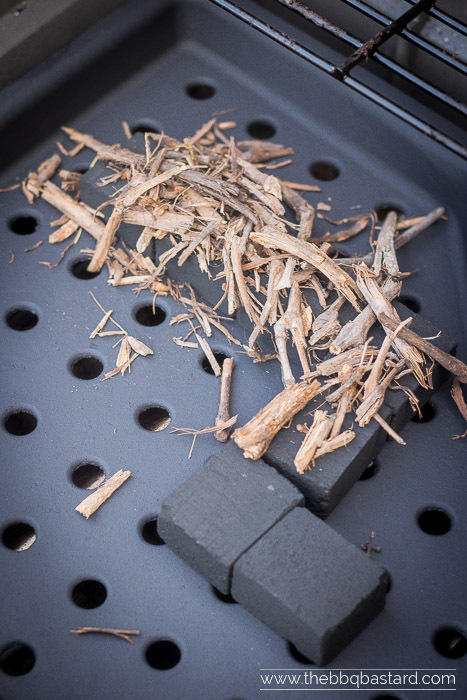 Add some smokewood on top of your heat source (use a cast iron tray when cooking on a gas grill, toss them in the fire when using a coal grill). 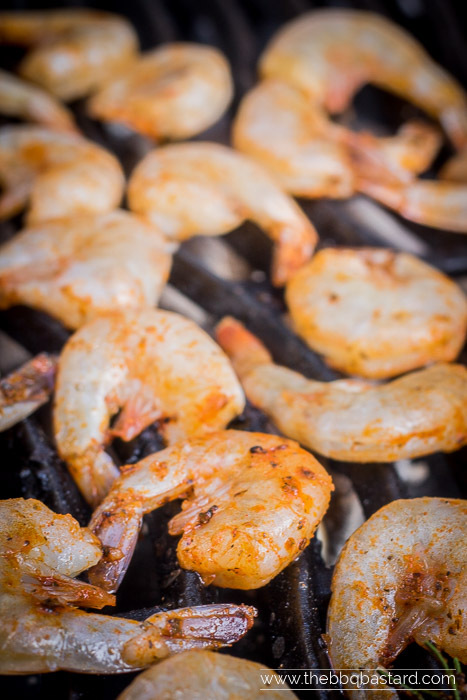 When the vines are smoking put the shrimps on top of the high heat source (above 200°C/400°F) and grill until the shrimp starts to get pink on the side. Flip over and grill for about 2 more minutes. Put some pasta in a bowl, add the vegetables and smoked garlic. Sprinkle some freshly cut parsley on top and finish with grated parmesan cheese! - I got the "Napoleon Rogue 425" from Napoleon Grills for 5 months to test their product. - There are affiliate links on the "Napoleon Rogue 425"
Like the recipes,i use smoky mountain electric. Hey Neil! Thanks a lot! Happy with your smoky mountain electric?